I’ve heard a lot of conflicting information about whether or not coconut oil is good for your heart. Yes, it’s true, approximately 90% of virgin coconut oil is saturated fat. This is alarming news among the health conscious because, if there is one thing we have been told over and over again it is, “saturated fat is associated with heart disease”. Heart disease is almost nonexistent in native tropical cultures where coconut is the primary source of dietary fat. In the 1930s, Dr. Weston Price discovered that heart disease was basically nonexistent for South Pacific Islanders. And, in 1981, in a study of two Polynesian communities, researchers found a link between exceptional cardiovascular health and their diet heavy in coconut oil. Not all saturated fats are equal. A lot of media attention has been placed on research that suggests that saturated fats raise LDL (the bad cholesterol) and lead to heart disease, but their is a growing debate about whether this is really true. Not all saturated fats are the same, different kinds vary in chemical structure and their effects on your body and heart. Consequently, unrefined virgin coconut oil has a completely different biochemical makeup than saturated fat found in animal products; they are not comparable. Instead of consisting of the long-chain fatty acids found in meat and diary, unrefined virgin coconut oil is made up of medium-chain fatty acids that appear to have a more neutral effect on blood cholesterol. These fatty acids are more easily digested. In addition, because this type of fat is not easily stored in our body, it burns off as energy, making coconut oil popular among athletes as a way to boost endurance. In addition, most of coconut oil’s saturated fatty acid is lauric acid which current research suggests actually raises HDL (good cholesterol). Most studies regarding saturated fats do not look at the diet as a whole, instead, they attempt to isolate the dietary factors that potentially contribute to heart disease. But we all know that we do not eat nutrients in isolation. Whole foods consist of a complex mix of vitamins, minerals, fats, and sugar that interact in ways we have yet to understand. As a result, studying one isolated factor is not necessarily a predictor of the total experience. A study that pulls one element must be evaluated very carefully before claiming to hold the “whole truth”. The truth is; there are no long-term studies on the effect of unrefined coconut oil on the American diet and heart disease. This does not mean coconut oil is potentially bad, it only means that no money has been invested into researching this concept. Coconut oil is void of omega-3 fatty acids. In our Healing inflammation with food blog we briefly discussed the importance of balancing your omega-3 and omega-6 intake. Because coconut oil consists mostly of saturated fats, it is not a good source of omega-3s. The standard western American diet is out of balance in the omega-3/omega-6 ratio, this causes concern for those who consume large amounts of coconut oil as it can potentially offset this balance even further, leading to inflammation and creating an environment that supports disease. If you are adding coconut oil in your diet, it is important to also get your Omega-3s. Some great sources are flax, soy beans and walnuts. Not all coconut oil is alike. Beware of hydrogenated coconut oil. It has been stripped of most of the nutrients and contains unhealthy trans fats. I also recommend staying away from refined coconut oil, which is made from dried coconut. It has been bleached and deodorized through the use of high heat to remove its odor and flavor. Some brands have also been chemically treated to assist with the oil extraction process. Unrefined virgin coconut oil is the healthiest to consume. It has been extracted from the fruit of fresh mature coconuts without using high temperatures or chemicals. As a result, it retains its phytonutrients, fresh coconut scent and flavor. Learn more. So… is coconut oil healthy or not? The lack of long-term studies that focus on the effects of unrefined coconut oil on heart health in relation to the American lifestyle leaves us guessing with only theories to guide us. However, what we do know is that eating whole plant-based foods provides the natural balance of nutrients, that coconut oil is easier for our body to process then animal and hydrogenated fats, and that cultures that use coconut oil as the main source of dietary fat experience almost nonexistent cardiovascular disease. Because the Western American diet is high in fat and processed foods, increasing your consumption of coconut oil without making any other dietary changes is not recommended. It is important to avoid over-consuming coconut oil simply because it has become the current “health food trend”. Coconut oil makes an excellent alternative for the unhealthy fats in your diet, but is best consumed in balance with your Omega-3s. It is also important to remember that it is not enough to simply add foods that are labeled as “healthy” to your diet, but to limit unhealthy foods that lack nutrients and promote a physiological environment that supports disease, such as processed foods and sugar, as well. I cook with small amounts of coconut oil, feeling confident that it is a healthier alternative. However, I am careful not to add excessive amounts, knowing that balance in my diet is essential for optimal health. Coconut oil promotes the healing of minor wounds. The antioxidants, collagen and antibacterial properties of coconut oil nourishes the skin and speeds healing. Gently message a small amount onto your minor cuts or scrapes or put a small drop on the Band-Aid before dressing the wound. Coconut oil is great for your skin. Applying small amounts to your body helps strengthen underlying tissue to prevent wrinkles as it moisturizes. A little goes a long way, just apply enough to lightly coat the skin and massage thoroughly. It may feel greasy at first, but in a few minutes it will begin to be absorbed. Use daily. Replace your shaving cream with coconut oil. Instead of soap or shaving foam, apply a thin layer to your legs (or for men, to your face) and then shave. The oil moisturizes while preventing razor burn and allows for a close shave. 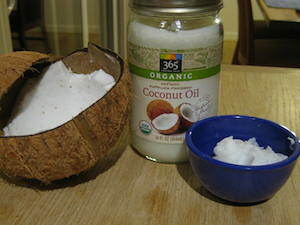 Oil pulling with coconut oil is great for your oral health. Oil pulling has been used for thousands of years to improve oral health. Take a tablespoon of coconut oil and let it melt in your mouth. As it liquefies, gently swish it around your teeth for 10-20 minutes. I know this seems like a long time, but as you do this, the harmful bacteria are “pulled” from your teeth into the oil creating a milky white froth. After swishing, do not swallow the oil, but spit it out into the sink then brush your teeth. If done daily, you will notice shinier teeth, fresh breath, less sensitivity, and healthier gums and teeth. This entry was posted in Nutrition, Plant-based, plant-based, Vegan, WFPB, Whole food, Whole food, plant-based and tagged coconut oil, cooking with coconut oil, dietary fats, fat, Healthy foods, healthy oils, heart health, Vegan. Bookmark the permalink.